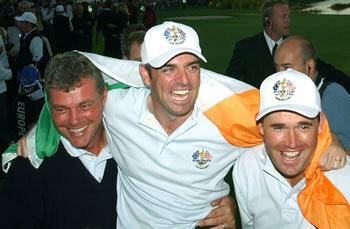 Darren Clarke, Paul McGinley and Padraig Harrington celebrate Europe’s huge win at The K Club in 2006. Photo: Eoin Clarke/NewsfilePadraig Harrington insists that Europe must avoid comparisons and appoint Paul McGinley to take on Tom Watson at Gleneagles rather than asking Darren Clarke to play captain fantastic in the 2014 Ryder Cup. Like Rory McIlroy and the majority of the team that pulled of the Miracle at Medinah last September, Ireland’s triple major winner sees his fellow Dubliner as the ideal candidate to battle major legend Watson and hopes that Clarke waits until 2016 to lead Europe in the US. Just don’t expect Clarke to go quietly. Quite the opposite. McIlroy’s Thursday night tweet calling for McGinley to get the captaincy next time was bizarrely re-tweeted by Clarke and led to the Dubliner taking over as the favourite on the betting exchange Betfair and shortening in price with bookies Ladbrokes and Coral. Whatever about Clarke’s intentions - his good play in this week’s Australian PGA may lead to renewed interest in making the side as a player - Harrington reckons it would be a mistake to try to win a popularity contest with Watson. “There simply isn’t anyone of Tom Watson’s status in Europe, we don’t have any eight-time Major champions,” Harrington said. “In golf, if you’re up against a real big hitter, the last thing you do is try to compete with him. “And the same applies in this situation. You don’t try and compete in Watson’s back garden, you take the battle elsewhere. And in that regard, Paul is the ideal candidate. Ruling out Scotland’s Colin Montgomerie or indeed himself, Harrington added: “Monty’s wise enough to be happy with his one stint as a winning captain at Celtic Manor, while I’ll be playing. “My own opinion is that the captaincy of the European team at the next Ryder Cup is between Paul and Darren. Personally, I’d like Paul to get it this time and Darren next time in the US in 2016. “It’s a brave decision if Darren steps aside now. If they were allowed appoint captains in a sequence, Paul would be the man for 2014; Darren would be an ideal captain to take the team to the ‘States, then you’d have Thomas Born for 2018 in France. “Each of the would be great Ryder Cup captains, though they’d be completely different in their approach. Paul’s exceptional flair for organisation and strategy would make him an efficient captain, like a Bernhard Langer. 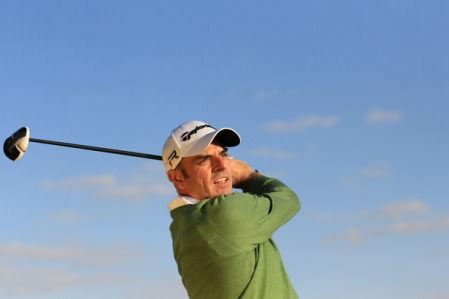 “Darren would be a motivational figure, out in front and leading everyone, perhaps in the way Ian Woosnam at The K Club. As for the appointment of Watson, Harrington said it was coming and sees it as a huge compliment to what Europe has achieved in winning seven of the last nine Ryder Cup matches. “It’s been flagged for a while. It really shows how much it means to them to bring out the big guns like this,” he said. 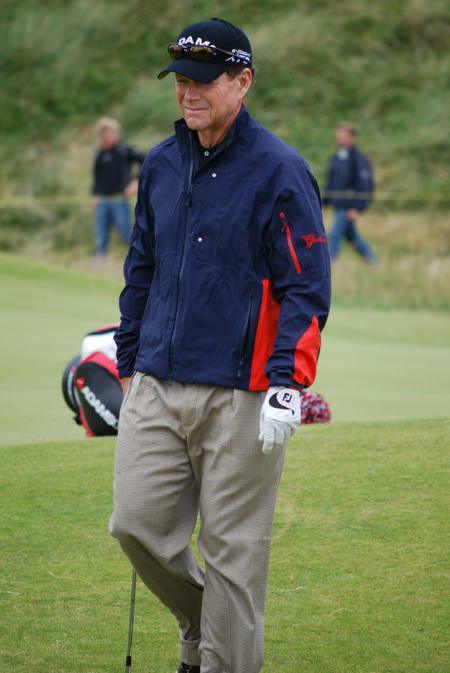 “Tom Watson brings a huge stature to the job – there’s a massive amount of respect for him in the US and on our team. “I don’t know if it’s possible for an opposing captain to be intimidating but he brings a lot of respect and status with him. Paul McGinley, European Ryder Cup Captain 2014, pictured at the Abu Dhabi HSBC Golf Championship by Fran Caffrey/www.golffile.iePaul McGinley clearly recalls the first time he met Tom Watson. It was at the US PGA at Atlanta Athletic Club in 2001. 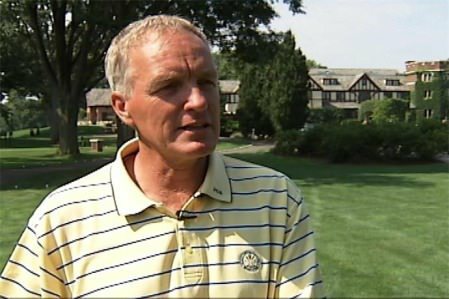 Kerry Haigh of the PGA of America says the grouping of Clarke, McGinley and Watson was not requested by Tom Watson.It’s no surprise that 2014 Ryder Cup skippers Paul McGinley and Tom Watson have been paired together for the first two rounds of the US PGA. But tournament director Kerry Haigh insists there was no premeditation in adding Darren Clarke to mix. Ryder Cup captains Paul McGinley and Tom Watson at Gleneagles. Picture Fran Caffrey www.golffile.iePaul McGinley predicts it will be “a heavyweight contest from toe-to-toe from start to finish” but whatever about the boxing analogies, the Year to Go weigh-in was a draw on points at Gleneagles yesterday.